Food Adventures of a Comfort Cook: If cooking were a religion, Bobby Flay would be a god. If cooking were a religion, Bobby Flay would be a god. He's an Iron Chef, owner of several restaurants, appears on countless cooking shows and specials, and his books are like bibles. Bobby Flay ( http://www.bobbyflay.com/ ) is a born New Yorker who specializes in Southwestern cuisine. He's personable, handsome, intelligent, and just an overall good guy; so what else would you want in a food god? I'd love to meet him someday. I'd be too scared to do a throwdown with him, but I'd love to just shake his hand and tell him what an inspiration he is to us foodies. Well, I'm a born New Yorker, and since moving out West, have become quite adept at Southwestern cuisine, but that's about where the similarity ends. I can live with that. Since moving out to Utah, I have learned that the restaurants out East, that advertise Southwestern cuisine, don't have a real clue; except those chefs that have bothered to learn it and get the real training to excel in it. The tastes and flavors not only explode your taste buds, but give you a "feel good" feeling...nothing like fresh chiles to get the blood flowing. It's also healthy for you. When I moved to Utah, my A1c (I'm a type 2 diabetic) was 11, had been on insulin for about 3 years, and just was having a heck of a time getting myself in control. But there was something about the area that changed my whole life. The air was the coolest and cleanest I've ever inhaled. Where I could only walk for 15-20 minutes in Pennsylvania before getting tired and weak; here I could walk the trails for hours, and still feel energized. The spirit of the mountain goat entered me, and my husband could only say, "She's going to f***ing kill herself", as he watched me climb the red rock formations, and jump from outcropping to outcropping. I lost weight, and am keeping it off...still have a long way to go, but I'm not so cranky about it. My blood sugar numbers are improving, and in 1 1/2 yrs, my A1c is now down to 6.5, the recommended number. My insulin intake has decreased, and my blood pressure is always normal. Yep, I'd say that moving out West was one of the best things I've ever done in my life, besides marrying Roy that is. Spray slow cooker dish with cooking spray. Add all ingredients and mix thoroughly. Set cooker on low, cook for 5-6 hours; stir occasionally. 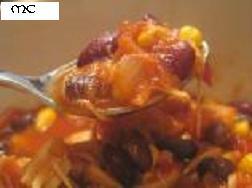 Place corn bread in soup bowl, ladle stew over bread. Makes 8 servings. A salad isn't a salad...yes it is.